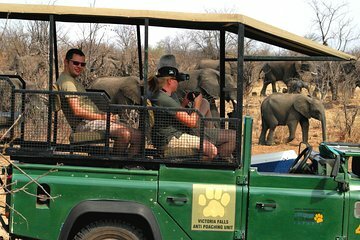 Play a direct role in wildlife conservation efforts by booking this tour with the Victoria Falls Anti Poaching Unit. Learn about anti-poaching efforts through an educational presentation, and then head to the bush to sweep for wire snares, record game sightings, and identify signs of poaching. Plus, a portion of every purchase supports the Victoria Falls Wildlife Protection Trust for a safari that helps preserve the environment for future generations. You will be picked up from your hotel or meeting point between 6am and 6:15am. Dress code: It is recommended to bring hats, good walking/hiking boots and wear neutral colours. Please bring a camera and binoculars if you have them. Sunscreen and water should be bought along with you.